Space station astronauts Sunita Williams, left, and Akihiko Hoshide, right, performed a spacewalk on Sept. 5, 2012. 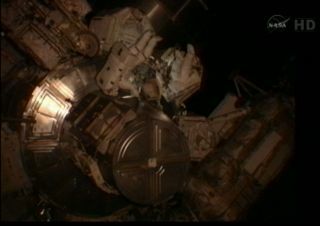 Two astronauts floated outside the International Space Station today (Sept. 5) — the second time in six days — to try to fix a power unit that was not properly installed in an earlier spacewalk last week. Space station residents Sunita Williams, of NASA, and Akihiko Hoshide, of the Japan Aerospace Exploration Agency, switched on the batteries on their spacesuits at 7:06 a.m. EDT (1106 GMT), signifying the official start of today's spacewalk. The duo is expected to spend 6 1/2 hours working in the vacuum of space to troubleshoot a pair of stuck bolts on a new replacement power unit to be attached to the space station's exterior. Today's extra spacewalk was added last week after the troublesome bolts prevented the component from being properly installed on Aug. 30. Last week, Williams and Hoshide removed a faulty MBSU and tried to install a new spare, but they were unable to drive in one of the bolts that fastens the unit to the station's truss. After repeated attempts failed, the astronauts used a tether to temporarily tie the MBSU down, and were forced to wrap up their marathon spacewalk. The outing lasted 8 hours and 17 minutes, making it the third longest spacewalk in history and the longest ever performed by a space station crew. The International Space Station has four MBSUs that harness power from the outpost's solar arrays and distribute it throughout the orbiting complex. Without the use of one unit, the station is unable to relay power from two of the eight solar arrays on the massive orbiting complex. In an unrelated mishap, a component that ensures power is distributed at the proper amperage and voltage suffered a glitch late Saturday (Sept. 1), NASA officials said. As a result, the station is only able to use five of its eight available power channels. With three power channels unavailable, flight controllers re-allocated available resources aboard the outpost for critical systems and to keep the crew safe. Despite the outages, space station operations have only suffered a minimal impact, and the crew will not be affected as they prepare for tomorrow's spacewalk, agency officials said. Mission managers opted to proceed with the extra spacewalk after working around the clock since Thursday to analyze the problem. "The most probable cause is likely a combination of a slight misalignment in the positioning of the spare unit for its installation prior to bolting and possible damage to the threads of the receptacle posts on the S-zero truss to which the MBSU must be bolted in place," NASA officials said in an update. Williams and Hoshide spent the weekend reviewing the choreography for the upcoming spacewalk, and preparing tools that will be used to clean and lubricate the MBSU bolts and their corresponding receptacles on the space station's truss. If, after four hours, the power unit cannot be properly installed, mission managers may opt to have the astronauts clean the power unit and bring the box inside the station for more analysis, NASA officials said.